Lets learn the basic stitches in crocheting. Learning to crochet can be fun, relaxing and even profitable sometimes. Unique and quality work in your creations is what will make customers want to buy them. You can make money crocheting creating items but the more profitable and easier way is to create patterns designs or teaching jobs. Inquire at the craft stores around your area. Also don't forget you can also save money with it. You can save a great deal of money on gifts as you can make beautiful keepsakes for a fraction of what you would have to pay to buy them. Handmade (not homemade) gifts mean so much more than store bought gifts. As there were thought out and created by you not mass-produced. There are only a couple of main stitches in crocheting that you need to learn to make beautiful items. There are many fancy stitches you can and will learn but they all stem from these two main stitches. Single and double crochet stitches will get you started off very nicely. With just these two stitches under your belt, you can make just about anything. Changing colors while crocheting is so easy, just drop one color and pick up another. With the color variations you give the item, you will make it truly yours. 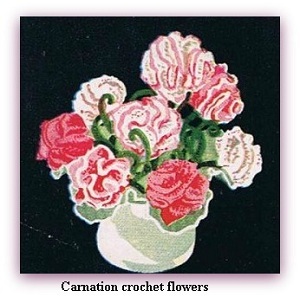 If you are creating a baby bonnet or making curtains, you will work with these two stitches. There are lots of projects and patterns you can do for profit or gifts. Check them out and you can create a keep-sake for your family. It is an easy craft to learn. Stick with the basic stitches in crocheting until you are comfortable. You can find easy crochet patterns with basic crochet instructions for baby booties and make a pair for a charity or an upcoming baby shower. Or you can check out some directions for crocheting a scarf and a hat. These are great gifts for family and friends. Much better than the store bought ones, you can use their favorite colors and even personalize the set. There is no end to the occasions that you could whip up a gift for. Not only do you get to enjoy the giving of the gift. But the making of the item is so relaxing.